Dr. Cher Rich and our team believe it’s much easier to prevent dental problems than to treat them after they have developed. Our patients tend to agree! This approach helps you spend less time (and money) in the dentist’s chair. 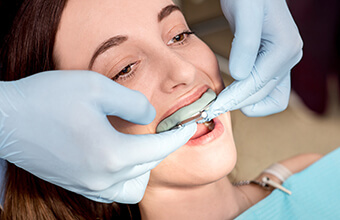 Our array of preventive services is engineered to catch even the smallest signs of dental problems at their earliest stages to save you from any future headaches. If it’s been a while since you’ve seen your Houston dentist, be sure to contact our office today to start getting a worry-free smile! 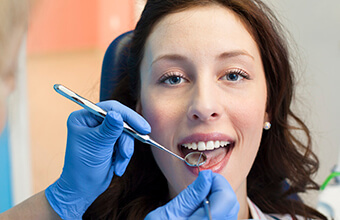 Checkups and cleanings are the bread and butter of essential dental care. 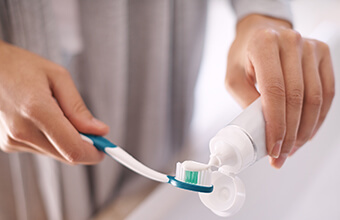 They help take care of your teeth in a way you just can’t at home, and they allow us to catch small dental issues before they can turn into bigger problems. Most appointments will start with a standard dental cleaning. For this, one of our skilled-hygienists will thoroughly clean your teeth to remove any plaque or bacteria that has built up on them. These cleanings specifically target the areas you simply can’t reach at home. 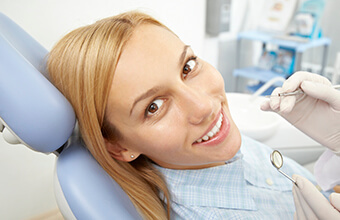 Afterward, Dr. Rich will give your mouth a thorough examination where she’ll look for signs of tooth decay, gum disease, and even oral cancer. She’ll use her observations to come up with a long-term treatment plan to make sure your smile is healthy and beautiful for years to come. To get the best results, she recommends that everyone, regardless of age, should have at least two checkups and cleanings per year. We love to take care of your most precious smiles! 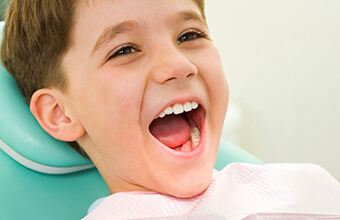 The American Academy of Pediatric Dentists recommends that you should bring your child in for their first dental visit as soon as their first tooth appears, or at least by their first birthday. When you bring your child to us, we’ll make sure to slowly introduce them to the office so they can become comfortable in the new environment. Most of us are mothers (and grandmothers!) ourselves, so we know how important a gentle touch is. We’ll perform a short oral exam and cleaning and then talk with you about how to take care of your child’s blossoming smile. 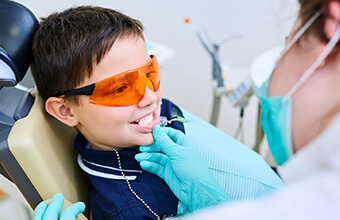 Dental sealants are made of a clear, thin layer of composite resin that is applied to the teeth in order to protect them from the buildup of food particles and bacteria. They are typically placed on the back teeth because they are the most often missed while brushing, especially by children. They are perfect for giving your child’s teeth a little bit of extra protection right when they need it. 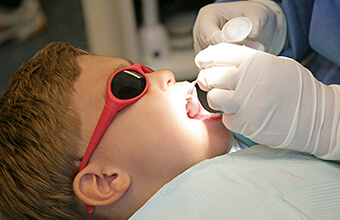 Be sure to ask about dental sealants at your child’s next appointment! Bruxism is a condition where a person clenches their jaw and grinds their teeth while they sleep, and about 1 in 3 people will deal with it at some point in their life. Over time, this can put tremendous pressure on the teeth and cause them to crack and break. To prevent this, we can provide you with a custom-fitted mouthpiece called a nightguard. You will only wear it to bed, and it will provide a protective layer between your teeth to inhibit them from grinding together. 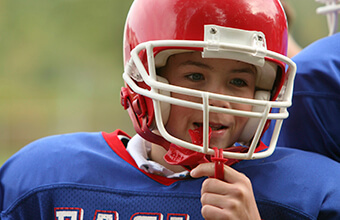 Sportsguards are an essential piece of protective equipment everyone should wear when playing any kind of sport. They provide an extra layer of cushion on your teeth and gums to shield them from injuries due to impacts. We can make you (or your child) a custom made sportsguard right here in our office. It will be made to fit only your particular teeth, and this will help it be more comfortable and do a better job of defending your smile than a generic store-bought mouthguard. Did you know that oral cancer steals the life of one American every hour? We don't hear much about oral cancer, but nearly 50,000 patients will be diagnosed with it this year alone, and only half will survive longer than five years. Because it is often detected in its later stages, oral cancer's mortality rate is higher than that of cervical, brain, liver, kidney, and ovarian cancer. All adults should have an annual ViziLite exam, because surprisingly, a quarter of oral cancer victims are non-smokers, don't drink excessively, and have no lifestyle factors to heighten their oral cancer risk. Men over 40 and women between the ages of 20 and 40 are the most prone to the disease. Patients with lifestyle risks, including any tobacco use, daily alcohol consumption, viral infections, autoimmune deficiencies like HIV, and diabetes may need more frequent evaluations. The screening involves a few simple steps. First, you will rinse your mouth thoroughly with a cleansing solution. Then, your dentist will dim the overhead lights and examine your gums, cheeks, and throat using the ViziLite wand. If the ViziLite finds a problem area, the spot will become illuminated and appear distinctly different from the surrounding normal tissue. While all of this information sounds disheartening, if oral cancer is found and treated in the early stages, the condition usually has an 80 to 90% survival rate. Ask your dentist about whether you could benefit from an oral cancer screening that includes ViziLite. The food we eat can damage our teeth, and by that we actually mean it can remove the essential minerals that give teeth their strength and durability. Fluoride has been used for years to fight cavities because it actually helps restore these lost minerals. This is why it is included in many toothpastes and public water sources. During your typical hygiene appointment, we’ll give you a fluoride treatment so your teeth can be extra protected from any decay. It can also help restore weak spots already present on your teeth! There are so many dental products available today that it can be tough to know which ones are actually right for you. Thankfully, we can offer you these products in our office along with the recommendation of which ones are the best for your smile. Fluoridex is a special toothpaste that provides excellent protection against tooth decay & sensitivity, and Peridex is great at eliminating nasty, foul-smelling bacteria that can cause gum disease. Be sure to ask about them at your next appointment.